Any frequent outdoor concert or festival attendees have the whole system down: you’ll see them with their portable folding chairs standing in line. Once they’re inside, they set them up with a few clicks, and settle in to enjoy the event. A good concert chair has specific requirements. They need to be comfortable, tough, easy to carry, and easy to set up. The Best Concert Chair is the WildHorn Terralite Portable Camp Chair. It has all of the above, plus some added features that give extra value. WildHorn obviously went the extra mile in product research for this chair, adding some innovative design features, as well as a durable chair that can hold up to 350 pounds. It’s strong, stable, and can be set up safely on varying terrains like gravel, sand, or soft ground. Trekololgy’s YIZI GO chair is also a very solid product with good durability and an adjustable height feature. It loses out to our winner by not being quite as sturdy. It doesn’t hold as much weight as our winner. The seat style is also awkward for people who are less mobile. The Moon Lence chair is our budget choice for the category. With the less expensive chair models, the construction is not quite as robust. This chair still holds a respectable amount of weight and is lightweight. Compared to the others, it feels less stable but is still a fine choice for the price. In this section, we’ll look closely at several of our favorite concert and festival chairs. We’ll start with a comparison table to get the lay of the land, and then move into a detailed examination of each chair. We’ll conclude with our favorite picks. The Moon Lence chair has a unique assembly, compared to the other chairs reviewed, and this has both good and bad qualities. Clearly, the good ones outweigh the bad, as this chair is our Budget Pick. First of all, the chair construction. Unlike the other chairs, which use heavier rods for the frame, the Moon Lence chair uses lighter but strong assembly rods – similar to the ones used on pop-up tents. For assembly, the user removes the chair from the bag and shakes out the jointed rods until they fall into place. The seat is then put on. The advantages of this particular design are that it’s very light, very compact when broken down, and very portable. This is a chair that can be easily thrown into a tote for your concert-going – or even clipped to it, with the carrying strap. The weight limit is quite good for the size of the chair, at 242 pounds. It should be comfortable for a wide range of users, from kids to good-sized adults. Like most of the camp chairs on our list, it features a seating position that reclines slightly. This is exactly where you want to be, for a relaxing time at a concert venue or festival. That said, it’s not the style of chair you’ll want to use for events where you’ll be getting up and down a lot. The seat and back are constructed from 420 denier nylon. The back is mesh, for ventilation, and there are additional mesh inserts on the side of the chair. The carrying case is also nylon and can be clipped to the frame of the chair while it’s in use. Both are easy to clean with a damp cloth. 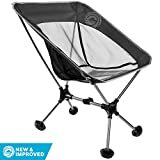 When you’re done using it, the chair clicks apart and folds down, the seat comes off, and it all stores back in the carrying bag. The Moon Lence is available in a range of cheery colors and darker tones that will suit any color scheme or cleaning schedule. 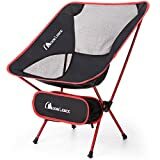 The Moon Lence line of folding camping chairs a great choice for an affordable chair that does exactly what a concert chair needs to do: Provide lightweight, packable, easily transportable comfort. It doesn’t have the weight capacity of some other chairs, and the leg tips aren’t quite as wide as some of the other chairs on our list. But it does make up for it in the utter compactness it provides. And of course, the price point is nice! The Trekology YIZI GO is a solid-looking chair that can be adjusted for height. It was our Runner-Up for the best chair in our group. This chair has a slightly deeper seat than most – it dips down an additional two inches, giving the user more room, and more comfort, as one might expect. However, that extra “dip” can make it hard for some to get up out of the chair, even when it’s adjusted to its full height. This is something to consider if a member of your group is less mobile. Assembly is done by clicking open the frame, which is made of an aircraft grade 7075 aluminum alloy. After a few clicks, it stands up and is ready to have the seat fabric slipped on. The seat has less mesh than some other designs and is placed in side insets. The fabric used is a heavy 600 denier nylon, which is also machine washable. Other nice built-in features are mesh side pockets for small items. If you don’t mind the “dip” of the seat, this is a good chair for a variety of statures. It can hold up to 300 pounds, and the seat height can be adjusted from 13 to 15 inches. This amount of configurability makes it more versatile than most chairs on our list. If you’re bringing chairs for a group, the YIZI GO is a great one to include. It also has rubber feet to help with stability. For packing into concerts, the YIZI GO compacts into a carry case of 14 x 4.3 x 6 inches. You won’t lose it in your tote bag, but it won’t weigh you down too much. Fabric comes in 4 bright but washable colors, with a matching, zipped carrying bag. When you’re done, you pop off the cover, it folds back down, and you reattach the velcro straps to keep it compact. This is a well-made chair with good stitching, easy cleaning, and more adjustability than most. The seat design may not be the best for anyone with impaired mobility, as it sinks lower than others. 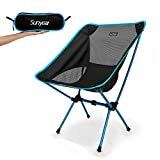 It’s durable enough to be used for camping or at other outdoor activities. The YIZI GO is a great option for many needs and is our Runner-Up, due the tweaks that can be made to the chair. The Sunyear chair is a basic concert chair – lightweight and cool, but users have noted some design problems with durability. The seat itself has a lot of mesh area – which is great if you’re hot-natured or sitting in the sun. It has mesh side inserts and almost the entire seat back area is mesh. The rest is made of 500 denier fabric, which is advertised as waterproof. It’s also machine washable, which may or may not impair the waterproofing factor – proceed carefully, if the waterproofing aspect is important to you. The actual seat is 13” high, and has a dip of about 2”. This could be an uncomfortable angle to sit at for some, and also a difficult ascent if your mobility is not good. The frame is constructed of 7075 aluminum alloy and will hold up to 250 lbs. Some have found issues with the actual frame construction, in that the elastic shock cords break and don’t hold up to a lot of heavy use. It does have rubber feet, which are fine, but not as heavyweight as some of the other chairs reviewed. The manufacturer is nice enough to include a video that is available on the web for anyone having difficulty assembling the chair. Otherwise, it is a shake-and-snap process, like the others. The chair breaks down by removing the seat and folding up the frame. The chair compacts down into a 13.8 x 5.3 x 4.3 in. carrying bag with a zipper, and weighs 1.8 lbs. Like the others, it is lightweight enough to easily pack into a tote bag or backpack for a concert or festival. The Sunyear is a lightweight but otherwise average chair, compared to some others reviewed. It is probably best suited for those with good knees, and who weigh under 225 lbs. Terralite Chair Package. The Best Concert Chair Around! The TerraLite chair has a good blend of price, features, and durability, making it our top choice in our Concert Chair reviews. Although weighing in at 2.07 lbs, the TerraLite can hold up to 350 lbs, making it the strongest chair in our group. If you want to have a chair that will handle virtually any person, as well as provide the durability that comes with that weight-bearing power, this will work well. In addition to the construction, this chair has a unique feature that pushed it to the top of our ratings. Unlike other chairs, which only have simple rubber feet, this one features TerraGrip feet that can be added on when needed. These can be exchanged with the regular feet, and have a rounded, wide base. The wide leg tips help keep the chair stable and help prevent the legs from sinking into soft sand, mud, or capsizing on gravel. With outdoor events being truly unpredictable, these feet have you prepared for any weather. The dimensions are comfortable. The seat is 14” off the ground, and has mesh inserts at the side and backs for ventilation in hot or muggy weather. Seat back height is 28”. Reviewers find it to be sturdy and solid feeling, even for larger people. The 600 denier nylon fabric is machine washable and has double stitching. It comes in colors in a range from bright to practical. The frame is constructed of rustproof 7075 aluminum alloy and is easy to assemble. Like the others reviewed, it clicks out from the folded-up configuration, and the seat slips on. When you’re done, the TerraLite folds back up and goes into the carry case, which measures 17 x 4.7 x 4.7 inches. It’s a little larger than some of the other carry bags, but the TerraGrip feet require more storage space and are worth the size tradeoff. The bag itself has two convenient hook-and-loop hangers that can be used for a carry strap or to attach it to another bag. In all, the TerraLite gives the buyer comfortable dimensions, durability, strength, and versatility – all at a mid-range price point. It can be easily used for all sorts of outdoor activities in a variety of environments. This is the best concert chair around! The Helinox line is based on their DAC tentpole technology, which uses incredibly durable anodized aluminum. The Chair One is manufactured to be a chair for backpackers who are looking for comfort and strength. It delivers on all of these selling points. Weighing in at only 1.9 lbs, this chair can support a robust 320 lbs and is quite well built. It holds up well, most buyers have found that its quality and durability are great. That said, this chair is the most expensive chair we reviewed, and for concert use, all that detail might not be necessary. The seat is extremely comfortable and more ergonomic than most collapsible style chairs. It’s made of 600 denier nylon and is well-constructed with double stitching. The sides and back have mesh insets that show where the quality is. 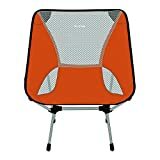 The mesh used on the Helinox is a thicker and more durable material than many competing chairs. Like any mesh insets, it gives quick-drying, cool comfort when the weather is warm. The nylon is machine washable and comes in several colors, including two shades of camo for those who like to hunt when not going to festivals. The frame unfolds and clicks together easily, and then the seat is installed. When folding down, the chair collapses down to fit in a 14″ x 4″ x 5” carry pack. The seat is 13.5” high off the ground, making it not as low as some of the other chairs reviewed. This makes the Chair One a bit more versatile than some of the other models that sit low and lean back. Most buyers find this chair to be sturdy, stable, and strong. It’s good for other applications in the great outdoors, since it was designed for backpackers. Other than the price, the one other problematic aspect of this chair is that the legs tend to sink in soft ground. Overall, the Helinox Chair One is a very well-made chair, but unless you are planning to use it for many other activities, it may not justify the price tag. Choosing the best concert chair involves weighing out several factors: Price, convenience, comfort and strength. When evaluating all these, our recommendations found some clear winners. For all-around use, the Wildhorn Outfitters TerraLite Festival Chair can hold more weight than any other on our list, at 350 lbs, has sturdy construction, and the unique TerraGrip feet made it our favorite. For a good price, you can’t beat its ability to stay put in soft terrain and its strength. And, coming in second, the Trekology YIZI GO adds some features that make it very appealing, like adjustable height and extra storage on the sides of the chair. We docked it a few points for being a bit hard to get out of, should you have mobility issues. The Moon Lence Concert Chair model gives a nice balance of price versus features and is vanishingly small.